The Crocheted Caddis Pupa was created by Torill Kolbu who is not only one one of the worlds leading fly tiers but she is also a member of the Norwegian World Championship Fly Fishing team. She explains how she uses this fly, "I fish the pupa upstream to rising fish in Jim Leisenring style. I let the fly sink and lift the rod tip just in front of the rise so that the pupa rises to the surface". Under body : Dubbing or floss, colour to suit. Body : One strand of green antron body yarn and one strand of lime green body yarn, crotcheted up body. Thorax : Dark grey dubbing. Antennae : Two long bronze mallard fibres. The size of antron strands to suit size of hook. Create the crocheted body using any two colours of your own choice. Partridge K12 Caddis Longshank. 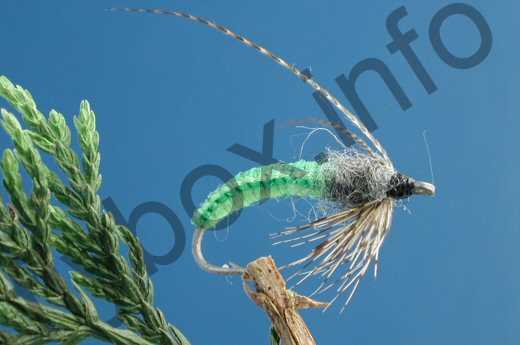 Currently there are no comments about the Crocheted Caddis Pupa fly pattern from other fly fishermen yet.